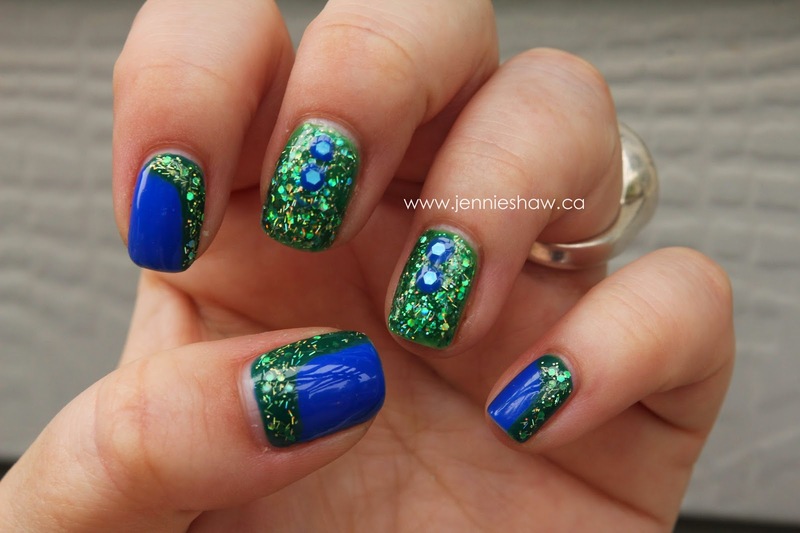 Let the recent nail art extravaganza continue! This week, I tried a new technique with a current obsession. You know, cause I literally am obsessed. Haha! I've seen this technique before, on Pinterest, and I have to say that I wish I'd tried it before! Why? Because it was pretty freaking easy, that's why! And isn't that the best? YES IT IS! To start, I did two coats of the breathtaking Monaco. Holy moly, do I ever love that blue. Oh, sorry. I got distracted. Haha! Where was I? Right! The curve! Using the regular ole brush from the essie polish, shake your $$ maker, I made a line, starting from the bottom of the nail, all along to the other side, and then up. I touched up the middle of the curve just a bit and then, when it was dry, went overtop with Monster Mash, also using the bottle's brush. Then, a coat of quick dry top coat sealed it all together. 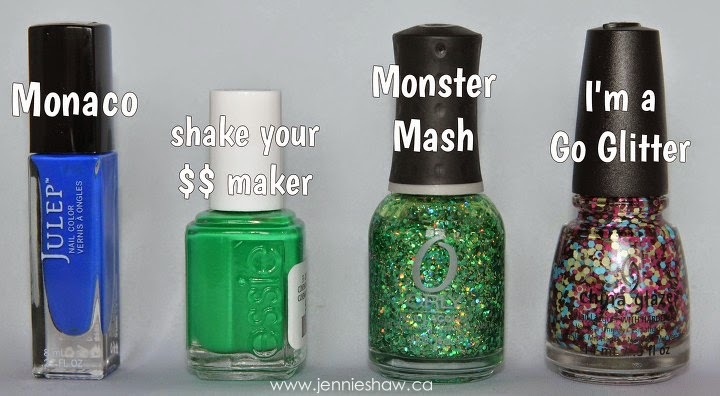 For the other two fingers, I did one coat of shake your $$ maker, followed by two coats of Monster Mash. When the base was dry, I used a medium-sized dotting tool, picked out some light blue hex bits from I'm a Go Glitter, and placed them in the centre. I should have waited until they were a bit dryer, though, because they sank into the polish and I lost some of the hard hex edges. *grumbles* Haha! These colors compliment each other SO FREAKING WELL! Also? I need monster mash stat. I'll have to try this style of nail art. I've been in such a nail art rut (I mean, sometimes I just want plain painted nails...I know...::gasp::) Thank you again, friend, for being just...so dang awesome. Ohhhhhhh girl this is stunning! Love it! before I read you post. I thought the blue dot were rhinestone. That so cool you grab them out of the polish. I have a really nice blue on my nail right now from Julep. Monster Mash is infreakingcredible! How did I not know this existed? It better not be limited edition. Those are great lines- I can't believe that's a freehand! I love the overall effect....am gonna have to try that with some color or something...hrmm.....thanks for more inspiration, yet again! I Looooooooove the look of the glitter over $ Maker!! So clever! Ok Jennie, you've done it again. I love your nails! Too cute! Thanks for hosting the link up and enjoy your day.